Objectives To assess the safety of intravitreal bevacizumab (IVB) as a monotherapy and to evaluate the relationship between quality of treatment and adverse events. Data sources Cochrane Library, Ovid MEDLINE, MEDLINE in-process, Ovid EMBASE and Toxicology Literature Online (TOXLINE) from January 2009 to May 2012. Studies included in an earlier systematic review were also assessed for inclusion. Study eligibility criteria, participants and interventions Randomised controlled trials (RCTs), controlled trials or observational studies including ≥10 participants reporting adverse events data following IVB monotherapy as a primary treatment in patients (aged 18 years or more) with any eye condition were included. Study appraisal and synthesis methods Study selection was undertaken independently by a minimum of two reviewers using pre-defined criteria. Data abstraction and quality assessment were performed by one reviewer, and then checked by a second reviewer. Study quality was assessed for only RCTs in accordance to the Cochrane Risk of Bias Tool. Additional items relating to safety data were also assessed. Results were tabulated or meta-analysed as appropriate. Results 22 RCTs and 67 observational studies were included. Only two RCTs reported valid safety data. Rates of serious adverse events following treatment were low. There was insufficient data to explore the relationship between the incidence of adverse events and quality of IVB injection. Limitations A majority of relevant existing studies were characterised by small sample sizes, unclear diagnostic criteria and reporting of safety outcomes. Conclusions and implications of key findings Available evidence demonstrates low rates of serious local and systemic adverse events following treatment. However, the role of IVB quality in the incidence of adverse events remains unclear. Robust evidence is needed to examine the relationship between the incidence of adverse events and variables such as injection techniques, pre-existing risk factors (eg, immunosuppression, cross-contamination) and quality of IVB treatment. Eighty-nine studies of bevacizumab monotherapy in patients with diverse ophthalmic conditions were included. A majority of relevant existing studies were characterised by small sample sizes, unclear diagnostic criteria and reporting of safety outcomes. The relationship between the incidence of adverse events and variables such as injection techniques, pre-existing risk factors (eg, immunosuppression, cross-contamination) and quality of bevacizumab could not be explored due to limited data. Bevacizumab remains an unlicensed ophthalmic treatment for a number of reasons. There is an on-going debate with regard to intravitreal bevacizumab (IVB) use and its quality in clinical practice. One major concern relates to the risks associated with the reformulating the drug for intravitreal injections as well as possible adverse events (AEs) associated with systemically administered anti-VEGFs. Bevacizumab is reformulated for intravitreal use to deliver a smaller volume. However, the resulting reformulated product is considered by the Medicines and Healthcare products Regulatory Agency, a UK regulatory body for medicines and medical devices, as an unlicensed product. Another concern has centred predominantly on the possible risk of serious AEs such as endophthalmitis. To date, IVB safety evidence have been inconclusive.4 ,5 The aim of this review was to assess the safety, in terms of rates of specific serious AEs, of IVB monotherapy in ophthalmic conditions. applied specific study design filters, for example, in vitro studies. Free text and subject headings or thesaurus terms relating to the intervention (eg, bevacizumab, avastin) were combined with AE floating subheadings or specific AE terms. We searched the Cochrane Library; Ovid MEDLINE; MEDLINE in-process; Ovid EMBASE; and Toxicology Literature Online (TOXLINE) from January 2009 to May 2012 because this review was part of a project commissioned by the National Institute for Health and Care Excellence (NICE) through its Decision Support Unit (DSU) between April to August 2012. We did not search clinical trial registers. No experimental and functional study design filter or language restrictions were used. Our MEDLINE search strategy presented as an on-line supplementary file 1 was translated across different databases. Reference lists of all relevant studies and systematic reviews were checked and a citation search of relevant articles was also undertaken. Study selection was undertaken independently by a minimum of two reviewers using pre-defined criteria. Any disagreements in the selection process were resolved by consensus or referral to a third reviewer. All published or unpublished randomised controlled trials (RCTs), controlled trials or observational studies including ≥10 participants reporting AE data following IVB monotherapy as a primary treatment in patients (aged 18 years or more) with any eye condition were included. Relevant comparators were limited to monotherapies for RCTs only. Articles were excluded if patients had received prior treatment or received IVB as an adjunctive treatment. Non-English reports, narrative reviews, editorials, letters or publications relating to preclinical and biological studies were also excluded. For RCTs, study quality was assessed in accordance to the Cochrane Risk of Bias Tool. Additionally, we assessed items relating to safety data for RCTs; these included follow-up period greater than 6 months, definition of AE and description of method of ascertaining AE. A formal quality assessment was not undertaken for observational studies. While checklists exist for evaluating the methodological quality of a range of non-randomised studies, there is no consensus on how to incorporate a single tool to appraise different study types in a review.6 It was anticipated that a variety of non-randomised study designs would be identified, so criteria assessed were limited to study design (eg, prospective or retrospective), length of follow-up and baseline comparability when appropriate. A pooled analysis was undertaken using the Cochrane Review Manager software where appropriate. The relative risk was calculated for dichotomous outcomes using a fixed effects model (Mantel-Haenszel method). Otherwise, descriptive statistics were tabulated. Estimates of AE rates were calculated by dividing the number of events by the number of patients who received IVB (event rate per patient) or the number of eyes treated (event rate per treated eye). A flow chart of the study selection is shown in figure 1. Eighty-nine full text articles were included (n=22 RCTs, n=67 non-randomised studies). Of these 20 studies, including 1 RCT, were identified from the previous review. A total of 293 full text articles were excluded. Reasons for exclusion were wrong population, intervention or study type (n=162), unsuitable publication type (reviews, commentaries or editorials; n=34) and absence of usable data (n=97). A full list of excluded studies with reasons for exclusion is available on request. Summary of study selection. This flow chart outlines the process of study selection for the systemic review based on the recommendations of the PRISMA statement. RCT, randomised controlled trial. A total of 22 RCTs comparing IVB with a variety of interventions as well as an observational control group with safety data were included, as presented in table 1.2 ,7–27 Study populations were patients with AMD (n=7 studies); DMO (n=8 studies); retinal vein occlusion (RVO) (n=4 studies) and other ophthalmic conditions (n=3). Assessment of study quality is presented as an on-line supplementary file 2. Study quality was considered to be moderate to low with only two RCTs16 ,19 meeting the criteria for valid safety data. Administration of 1.25 mg/0.05 mL was the most commonly reported dosage of IVB. Frequency of dosing and follow-up schedules varied across studies. Information relating to the source of IVB was reported in 35% (n=14/22) of RCTs but less than a fifth (19%; n=13/67) of observational studies.28 ,42–44 ,47 ,48 ,59 ,62 ,66 ,68 ,74 ,81 ,91 IVB was mostly provided by a local dispensing service such as the hospital's pharmacy. There were limited data to assess quality of administered IVB. Ascertainment of AEs was presented more objectively in RCTs compared to observational studies. Non-RCT evidence was unclear because several studies reported absence of events as ‘no serious complications’; or ‘no ocular complications’, or ‘no adverse events were observed’, thereby providing limited information on diagnostic techniques or criteria for reported AEs. Furthermore, for AEs such as visual loss, ocular haemorrhage, hypertension and hospitalisation, the relationship between the outcomes and treatment schedule or setting remained largely unclear. Pooled 1-year data16 ,19 indicated that the risk of death (RR 1.38; 95% CI 0.71 to 2.68) or arteriothrombotic events (RR 0.81; 95% CI 0.42 to 1.59) were not significantly different between patients with AMD who received IVB or intravitreal ranibizumab (IVR). Furthermore, no significant difference in death between the IVB and IVR arms was observed when the CATT16 (2 year data) and IVAN19 (1 year preliminary data) clinical trials were pooled to provide long-term data analyses as shown in figure 2. Cardiac disorders, transient ischaemic attack and hospitalisation for angina were not significantly different between patients with AMD treated with IVB and IVR.19 However, serious systemic AE rates remained significantly lower in the IVR group (n=1795, RR 1.27 CI 1.09 to 1.47). Pooled analysis of systemic adverse events comparing intravitreal bevacizumab with intravitreal ranibizumab in patients with age-related macular degeneration. This figure shows the pooled effect estimate for systemic adverse events comparing intravitreal bevacizumab with intravitreal ranibizumab in patients with age-related macular degeneration. IVB, intravitreal bevacizumab; IVR, intravitreal ranibizumab. This figure has been reproduced from the full report related to this project available at http://www.nicedsu.org.uk/Bevacizumab%20report%20%20NICE%20published%20version%2011.04.13.pdf. Two smaller studies, Biswas et al15and Gharbiya et al,18 with safety data for patients with AMD reported no significant AEs. No significant differences were found for death and myocardial infarction (MI) in studies that compared IVB to pegaptinib26or sham injection7 (n=232 patients, RR 0.30; 95% CI 0.01 to 7.18). One short-term study at 3 months20 showed that posterior vitreous detachment was significantly higher in the IVB group compared with laser therapy (n=110; RR 17.00; CI 1.01 to 287.50). However, the rates of uveitis, vitreous haemorrhage, pigment epithelial tears and cataract progression were low and indicated no significant differences between IVB and laser therapy. No significant differences in rates of foveal haemorrhage13 (n=81; RR 0.62; 95% CI 0.28 to 1.35) or hyphema27 (n=26; RR 7.8; 95% CI 0.46 to 131.62) were found in patients with RVO who had IVB or sham injection. Table 3, summarising safety data reported in observational studies, displays extensive variation in the detail of reporting of AEs with most studies not reporting or observing AEs of interest. While high event rates were reported for hospitalisation, hypertension, anterior chamber reaction and visual loss, these rates need to be interpreted with caution due to previously mentioned issues with reporting along with likely confounders. Eighty-nine studies were included in this systematic review of AEs, 22 of which were RCTs. Trials compared IVB with a number of different therapies and eye conditions, though most were in AMD, DMO and RVO. Most ocular and systemic safety measures had zero events in treatment groups or were not significantly different between groups. The quality of reporting of studies made it impossible to evaluate the impact of both known and unknown confounding factors (eg, the use of prophylactic antibiotic eye drops) on the incidence of AEs. The most robust data for safety are from the CATT16 and IVAN19 trials which were large trials that reported longer term data. The results of these trials when meta-analysed revealed a statistically significantly higher rate of 1 or more serious systematic AE (RR 1.27; 95% CI 1.09 to 1.47) in the IVB group. In this analysis, the IVAN study19 alone did not show a statistically significant difference while event rates were higher in the CATT. The recently published 2-year results of the IVAN study, which was not included in this review, has reported relatively worse safety outcomes for patients on discontinuous treatment compared to continuous treatment.97 In addition, there were no observed differences in mortality, frequency of thrombotic events or hospitalisation due to cardiac failure between groups of patients treated with IVB or IVR. Reported pooled analysis of the 2 years results of the CATT and IVAN studies tends to demonstrate that IVB and IVR are comparable in terms of safety. It is also important to note that AEs were more common in those patients who received discontinuous rather than patients on continuous treatment, that is, those with lower exposure to the drug experienced higher AE rates. An explanation for this observation is the possible role of immunological processes in drug interactions.97 It is also important to note that the CATT study demonstrated some imbalances at baseline between randomised patients which may need further exploration. More patients randomised to IVB had had a previous TIA compared to those in the IVR arms. Similarly, more IVB patients had a history of MI.16 Despite these caveats, these trial designs offer the most robust assessment of AEs to date. Overall, the evidence on IVB safety from observational studies was uncertain. This has previously been reported elsewhere.4 ,5 Included studies were frequently associated with methodological weaknesses that limited the validity of the reported findings. The majority of studies were retrospective in design with small study samples or inadequate follow-up periods (less than 6 months). With respect to larger studies, observational data from Curtis et al.45 suggest no difference in the risk of AEs between IVB and IVR once socioeconomic confounders are accounted for. On the other hand, results of an unpublished study of Medicare patients funded by Genentech54 found an increased risk of stroke and death in IVB patients. The available abstract, however, did not provide sufficient information to allow an in-depth analysis of the results of this study. A recently published population-based, nested case-control study reported by Campbell et al98 (n=91 378) found no relationship between the risk of MI, venous thromboembolism, stroke or congestive heart failure and the administration of IVR or IVB. While the risk of systemic AEs was similar for both treatment groups, there was an increased risk of acute MI for a subgroup of patients with diabetes who received IVB. This review highlighted the challenges of assessing the safety of IVB especially due to limited opportunities for in-depth detailed analyses of the relationship between IVB preparation and reported rates of infectious endophthalmitis. In the past, case reports have suggested contaminated batches of IVB as the primary source of infection; a published review of patient safety information held by the National Patient Safety Agency in England and Wales99 reported an increased risk of serious AEs including endophthalmitis following IVB treatment. The authors acknowledged that identifying the source of infection (ie, contaminated injection procedure or infected anti-VEGF) could be complex. However, Jonas et al,63 reporting on AE rates in a study population which included patients who had received IVB and IVT, suggested that event rates were statistically independent of drug injected (p=0.45), operating surgeon (p=0.18) and patient's age (p=0.87). It is also important to highlight limitations of this review. By relying on the previous systematic review5 as a source of evidence, it is possible that studies that were not identified in that review may have been missed in this review. Our searches were undertaken up to 2012. An updated electronic literature search was conducted up to 23 May 2014, retrieving a total of 1300 records. A preliminary shift of titles resulted in 333 potentially relevant abstracts for further detailed examination. We would prefer to have undertaken a full update. Unfortunately, this is not possible for us at present due to lack of the extensive time and resources required. 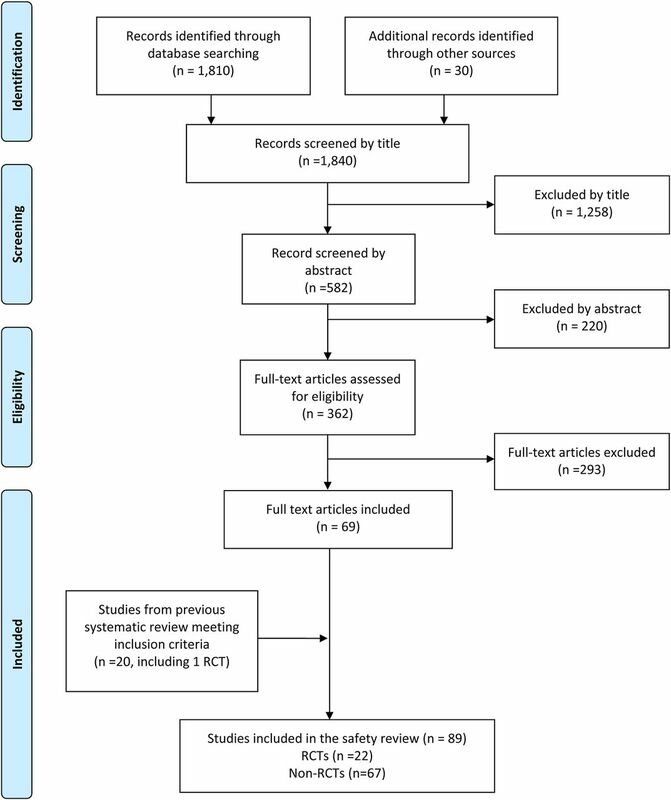 Although comprehensive and up-to-date systematic reviews are desirable, a recent analysis of a sample of systematic reviews showed that the median duration of survival indicating a requirement for an update was 5.5 years (95% CI 4.36 to7.67) in systematic reviews of randomised trials of procedures or conventional drugs.100 Furthermore, many RCTs randomised small numbers of participants and these may have been underpowered to detect differences in AEs.4 ,97 Generalisability of findings may also be limited due to differences between study participants and patients seen in routine practice. In addition, there were concerns relating to ascertainment of exposure particularly in observational studies.98 The influence of excluding non-English publications in this review is unclear. Additionally, adopting a narrow focus in the definition of AEs implies that data on less serious or rare events were not presented. Overall, rates of serious AEs following IVB were low when compared to other intravitreal treatments, sham injection and laser therapy with relatively higher rates being reported in head-to-head studies of IVB versus ranibizumab. Most outcomes were, however, not significantly different between treatment groups. Current evidence from observational data still remains limited due to relatively small sample sizes, unclear definition, evaluation and reporting of safety outcomes as well as adequate follow-up periods. However, an opportunity to explore the relationship between the incidence of AEs and other variables such as injection techniques, pre-existing risk factors (eg, immunosuppression, cross-contamination) and quality of IVB could offer cost-saving options in providing treatment for certain ophthalmic conditions. We would like to thank Jennifer Dunn for administrative support throughout the project.
. Leading causes of certification for blindness and partial sight in England and Wales. BMC Public Health 2006;6:58.
. Two-year results of a randomized trial of intravitreal bevacizumab alone or combined with triamcinolone versus laser in diabetic macular edema. Retina 2012;32:314–21.
. Ranibizumab (Lucentis) versus bevacizumab (Avastin): modelling cost effectiveness. Br J Opthalmol 2007;91:1244–6.
. Intravitreal bevacizumab (Avastin) versus ranibizumab (Lucentis) for the treatment of age-related macular degeneration: a safety review. Br J Opthalmol 2011;95:308–17.
. A systematic review of the adverse events of intravitreal anti-vascular endothelial growth factor injections. Retina 2011;31:1449–69.
. The feasibility of creating a checklist for the assessment of the methodological quality both of randomised and non-randomised studies of health care interventions. J Epidemiol Community Health 1998;52:377–84.
. Intravitreal bevacizumab with or without triamcinolone for refractory diabetic macular edema; a placebo-controlled, randomized clinical trial. Graefes Arch Clin Exp Ophthalmol 2008;246:483–9.
. A comparison of three different intravitreal treatment modalities of macular edema due to branch retinal vein occlusion. Curr Eye Res 2010;35:925–9.
. A prospective randomized trial of intravitreal bevacizumab or laser therapy in the management of diabetic macular edema (BOLT study) 12-month data: report 2. Ophthalmology 2010;117:1078–86.
.; Diabetic Retinopathy Clinical Research Network. A phase 2 randomized clinical trial of intravitreal bevacizumab for diabetic macular edema. Ophthalmology 2007;114:1860–7.
. Intravitreal bevacizumab versus combined bevacizumab-triamcinolone versus macular laser photocoagulation in diabetic macular edema. Eur J Ophthalmol 2008;18:941–8.
. Bevacizumab for macular edema in central retinal vein occlusion: a prospective, randomized, double-masked clinical study. Ophthalmology 2012;119:1184–9.
. Intravitreal bevacizumab vs. sham treatment in acute branch retinal vein occlusion with macular edema: results at 3 months. Graefes Arch Clin Exp Ophthalmol 2011;249:193–200.
. Intravitreal bevacizumab vs verteporfin photodynamic therapy for neovascular age-related macular degeneration. Arch Ophthalmol 2007;125:1357–61.
. Comparing ranibizumab with bevacizumab. Ophthalmology 2011 118:600–600.e2. http://www.sciencedirect.com/science/article/pii/S0161642010011036 (accessed 10 Jun 2012).
.; CATT Research Group. Ranibizumab and bevacizumab for treatment of neovascular age-related macular degeneration: two-year results. Ophthalmology 2012;119:1388–98.
. Prospective study of intravitreal triamcinolone acetonide versus bevacizumab for macular edema secondary to central retinal vein occlusion. Retina 2011; 31:838–45.
. Choroidal neovascularization in pathologic myopia: intravitreal ranibizumab versus bevacizumab—a randomized controlled trial. Am J Ophthalmol 2010;149:458–64.
. Ranibizumab versus bevacizumab to treat neovascular age-related macular degeneration: one-year findings from the IVAN Randomized Trial. Ophthalmology 2012;119:1399–411.
. Verteporfin therapy and intravitreal bevacizumab combined and alone in choroidal neovascularization due to age-related macular degeneration. Ophthalmology 2007;114:1179–85.
. Comparison of intravitreal bevacizumab alone or combined with triamcinolone versus triamcinolone in diabetic macular edema: a randomized clinical trial. Ophthalmologica 2012;227:100–6.
. Intravitreal bevacizumab alone or combined with triamcinolone acetonide as the primary treatment for diabetic macular edema. Clin Ophthalmol 2011;5:1011–16.
. Role of intravitreal bevacizumab in Eales disease with dense vitreous hemorrhage: a prospective randomized control study. Retina 2011;31:866–70.
. Comparing treatment of neovascular age-related macular degeneration with sequential intravitreal Avastin and Macugen versus intravitreal mono-therapy—a pilot study. Curr Eye Res 2011;36:958–63.
. A prospective, randomized comparison of intravitreal triamcinolone acetonide versus intravitreal bevacizumab (avastin) in diffuse diabetic macular edema. Middle East Afr J Ophthalmol 2010;17:250–3.
. Bevacizumab for neovascular age related macular degeneration (ABC Trial): multicentre randomised double masked study. BMJ 2010;340:c459.
. Intravitrealbevacizumab for neovascular glaucoma: a randomized controlled trial. J Glaucoma 2009;18:632–7.
. Intravitreal bevacizumab for treatment of neovascular age-related macular degeneration: the second year of a prospective study. Am J Ophthalmol 2009;148:59–65.
. Effect of the Honan intraocular pressure reducer on intraocular pressure increase following intravitreal injection using the tunneled scleral technique. Jpn J Ophthalmol 2011;55:632–7.
. Intravitreal bevacizumab (Avastin) for choroidal neovascularisation secondary to pathological myopia: 6-month results. Br J Ophthalmol 2008;92:1035–9.
. Sustained elevation of intraocular pressure after intravitreal injections of anti-VEGF agents. Br J Ophthalmol 2011;95:1111–14.
. Comparison between intravitreal bevacizumab and triamcinolone for macular edema secondary to branch retinal vein occlusion. Korean J Ophthalmol 2009;23:259–65.
. Intravitreal bevacizumab therapy for neovascular age-related macular degeneration: a pilot study. Graefes Arch Clin Exp Ophthalmol 2007;245:651–5.
. Intravitreal bevacizumab for subfoveal choroidal neovascularization in age-related macular degeneration at twenty-four months: the Pan-American Collaborative Retina Study. Ophthalmology 2010;117:1974–81.
. Incidence and management of acute endophthalmitis after intravitreal bevacizumab (Avastin) injection. Eye 2009;23:2187–93.
. Intravitreal bevacizumab for subfoveal choroidal neovascularization secondary to age-related macular degeneration in an Indian population. Jpn J Ophthalmol 2008;52:52–6.
. Two-year comparison of photodynamic therapy and intravitreal bevacizumab for treatment of myopic choroidal neovascularisation. Br J Opthalmol 2010;94:864–70.
. Bilateral simultaneous intravitreal injections in the office setting. Am J Ophthalmol 2009;148:66–9.
. Intravitreal bevacizumab for neovascular age-related macular degeneration with or without prior treatment with photodynamic therapy: one-year results. Retina 2010;30:85–92.
. Arterial thromboembolic events in patients with exudative age-related macular degeneration treated with intravitreal bevacizumab or ranibizumab. Ophthalmologica 2011;225:211–21.
. Treatment of branch retinal vein occlusion induced macular edema in treatment-naive cases with a single intravitreal triamcinolone or bevacizumab injection. Chang Gung Med J 2010;33:424–35.
. Intravitreal bevacizumab in the treatment of neovascular age-related macular degeneration, 6-and 9-month results. Eye 2008;22:82–6.
. Intravitreal bevacizumab for choroidal neovascularization caused by AMD (IBeNA Study): results of a phase 1 dose-escalation study. Invest Ophthalmol Vis Sci 2006;47:4569–78.
. Intravitreal bevacizumab for treatment-naive patients with subfoveal occult choroidal neovascularization secondary to age-related macular degeneration: a 12-month follow-up study. Retina 2009;29:1227–34.
. Risks of mortality, myocardial infarction, bleeding, and stroke associated with therapies for age-related macular degeneration. Arch Ophthalmol 2010;128:1273–79.
. Changes of intraocular pressure after intravitreal injection of bevacizumab (Avastin). Retina 2007;27:1044–7.
. Incidence of endophthalmitis related to intravitreal injection of bevacizumab and ranibizumab. Retina 2008;28:1395–9.
. Intravitreal bevacizumab (Avastin) for neovascular age-related macular degeneration using a variable frequency regimen in eyes with no previous treatment. Clin Experiment Ophthalmol 2008;36:748–55.
. Effect of prophylactic intraocular pressure-lowering medication on intraocular pressure spikes after intravitreal injections. Arch Ophthalmol 2010;128:1523–7.
. Six cases of sterile endophthalmitis developed consecutively after intravitreal injection of bevacizumab [abstract]. Nippon Ganka Gakkai Zasshi—Acta Societatis Ophthalmologicae Japonicae 2011;115:706–10.
. Bevacizumab versus ranibizumab in the treatment of exudative age-related macular degeneration. Int Ophthalmol 2010;30:261–6.
. Efficacy of intravitreal bevacizumab for polypoidal choroidal vasculopathy. Br J Opthalmol 2008;92:70–3.
. Submacular haemorrhages after intravitreal bevacizumab for large occult choroidal neovascularisation in age-related macular degeneration. Br J Opthalmol 2008;92:210–12.
. Adverse event rates following intravitreal injection of avastin or lucentis for treating age-related macular degeneration [abstract]. Invest Ophthalmol Vis Sci 2011;129; ARVO Suppl.
. Short-term effects of intravitreal bevacizumab for subfoveal choroidal neovascularization in pathologic myopia. Retina 2007;27:707–12.
. Adverse events associated with intraocular injections of bevacizumab in eyes with neovascular glaucoma. Graefes Arch Clin Exp Ophthalmol 2012;250:603–10. ,et al. Short-term intraocular pressure changes after intravitreal injection of bevacizumab. Can J Ophthalmol 2007;42:807–11.
. Intravitreal bevacizumab for choroidal neovascularization attributable to pathological myopia: one-year results. Am J Ophthalmol 2009;147:94–100.
. Incidence of endophthalmitis after intravitreal injection of antivascular endothelial growth factor medications using topical lidocaine gel anesthesia. Retina 2011;31:669–72.
. One-year results after intravitreal bevacizumab therapy for macular edema secondary to branch retinal vein occlusion. Graefes Arch Clin Exp Ophthalmol 2009;247:27–33.
. Incidence and characteristics of acute intraocular inflammation after intravitreal injection of bevacizumab: a retrospective cohort study. Can J Ophthalmol 2010;45:239–42.
. Infectious and noninfectious endophthalmitis after intravitreal bevacizumab. J Ocul Pharmacol Ther 2007;23:240–2.
. Short-term complications of intravitreal injections of triamcinolone and bevacizumab. Eye 2008;22:590–1.
. Intravitreal bevacizumab as first local treatment for uveitis-related choroidal neovascularization: long-term results. Acta Opthalmol 2011;89:179–84.
. Effect of intravitreal bevacizumab based on optical coherence tomography patterns of diabetic macular edema. Ophthalmologica 2011;226:138–44.
. Evaluation of anterior chamber inflammatory activity in eyes treated with intravitreal bevacizumab. Retina 2006;26:877–81.
. Efficacy of intravitreal bevacizumab (Avastin) therapy for early and advanced neovascular age-related macular degeneration. Acta Opthalmol 2009;87:611–17.
. Intravitreal Avastin for macular oedema secondary to retinal vein occlusion: a prospective study. Br J Ophthalmol 2008;92:518–22.
. Submacular haemorrhage after intravitreal bevacizumab compared with intravitreal ranibizumab in large occult choroidal neovascularization. Clin Experiment Ophthalmol 2009;37:384–8.
. Secondary rhegmatogenous retinal detachment following intravitreal bevacizumab in patients with vitreous hemorrhage or tractional retinal detachment secondary to Eales’ disease. Graefes Arch Clin Exp Ophthalmol 2012;250:685–90.
. Intravitreally administered bevacizumab (Avastin) in minimally classic and occult choroidal neovascularization secondary to age-related macular degeneration. Graefes Arch Clin Exp Ophthalmol 2007;245:68–73.
. Evaluation of safety for bilateral same-day intravitreal injections of antivascular endothelial growth factor therapy. Retina 2009;29:1213–17.
. Serous pigment epithelial detachment in age-related macular degeneration: comparison of different treatments. Eye 2009;23:2163–8.
. Subconjunctival reflux and need for paracentesis after intravitreal injection of 0.1 ml bevacizumab: comparison between 27-gauge and 30-gauge needle. Graefes Arch Clin Exp Ophthalmol 2010;248:1573–7.
. Incidence of acute onset endophthalmitis following intravitreal bevacizumab (Avastin) injection. Retina 2008;28:564–7.
. Bevacizumab therapy for macular edema in central retinal vein occlusion: Long-term results. Oman J Ophthalmol 2009;2:73–8.
. The effect of intravitreal bevacizumab (avastin) administration on systemic hypertension. Eye 2009;23:1714–18.
. Bevacizumab compared with macular laser grid photocoagulation for cystoid macular edema in branch retinal vein occlusion. Retina 2009;29:511–15.
. Effect of reflux of drug during intravitreal anti-VEGF therapies on foveal thickness. Semin Ophthalmol 2011;26:61–3.
. Outcomes and risk factors associated with endophthalmitis after intravitreal injection of anti-vascular endothelial growth factor agents. Ophthalmology 2011;118:2028–34.
. Rate of serious adverse effects in a series of bevacizumab and ranibizumab injections. Can J Ophthalmol 2012;47:275–9.
. Bevacizumab for neovascular age-related macular degeneration using a treat-and-extend regimen: clinical and economic impact. Am J Opthalmol 2012;153:468–73.
. Complications in patients after intravitreal injection of bevacizumab. Acta Ophthalmol 2008;86:372–6.
. Macular detachment after successful intravitreal bevacizumab for myopic choroidal neovascularization. Jpn J Ophthalmol 2011;55:378–82.
. Bevacizumab for the treatment of macular oedema in patients with diabetic retinopathy and retinal vascular occlusive disorders. Auton Autacoid Pharmacol 2010;30:144–7.
. Changes in aqueous concentrations of various cytokines after intravitreal triamcinolone versus bevacizumab for diabetic macular edema. Am J Opthalmol 2011;152:686–94.
. Comparison of the short-term effects of intravitreal triamcinolone acetonide and bevacizumab injection for diabetic macular edema. Korean J Ophthalmol 2011;25:156–60.
. One-year outcomes of less frequent bevacizumab in age-related macular degeneration. Retina 2011;31:645–53.
. Retinal pigment epithelium tear after intravitreal bevacizumab for exudative age-related macular degeneration. Am J Opthalmol 2006;142:1068–70.
. Multifocal electrophysiologic findings after intravitreal bevacizumab (avastin) treatment. Retina 2012;32:972–6.
. The treatment of choroidal neovascularizations in age-related macular degeneration using either avastin or lucentis. Klin Monbl Augenheilkd 2009; 226:294–8.
. Retinal pigment epithelium tears after intravitreal bevacizumab in pigment epithelium detachment. Am J Opthalmol 2007;144:294–6.
. Acute intraocular inflammation after intravitreous injections of bevacizumab for treatment of neovascular age-related macular degeneration. Ophthalmology 2008;115:1911–15.
. Twelve-month safety of intravitreal injections of bevacizumab (Avastin): results of the Pan-American Collaborative Retina Study Group (PACORES). Graefes Arch Clin Exp Ophthalmol 2008;246:81–7.
. Prognostic factors for visual outcome after intravitreal anti-vegf injection for naive myopic choroidal neovascularization. Retina 2012;32:949–55.
. Intravitreal bevacizumab for treatment of subfoveal idiopathic choroidal neovascularization: results of a 1-year prospective trial. Am J Opthalmol 2012;153:300–6.
. Alternative treatments to inhibit VEGF in age-related choroidal neovascularisation: 2-year findings of the IVAN randomised controlled trial. 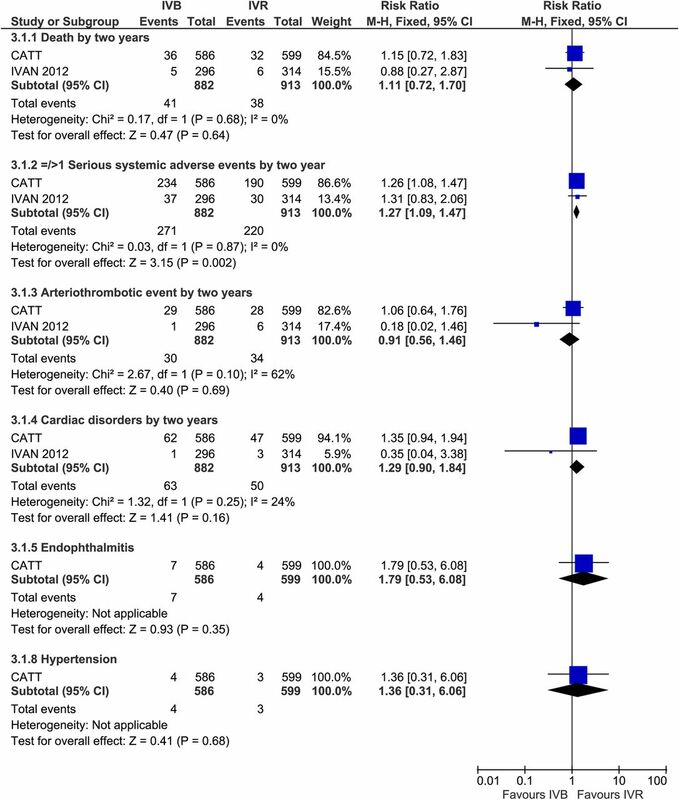 Lancet 2013;382:1258–67.
. Adverse events with intravitreal injection of vascular endothelial growth factor inhibitors: nested case-control study. BMJ 2012;345:e4203.
. A review of safety incidents in England and Wales for vascular endothelial growth factor inhibitor medications. Eye 2011;25:710–16.
. How quickly do systematic reviews go out of date? Ann Intern Med 2007;147:224–33. Contributors EP coordinated the systematic review and was responsible for the conception and design, acquisition of data, analysis and interpretation of data and drafting and revision of the final manuscript. JR was responsible for the conception and design, acquisition of data, analysis and interpretation of data and drafting and revision of the final manuscript. RW was responsible for the developing and undertaking the electronic literature searches and drafting and revision of the final manuscript. EE-H and ME were responsible for acquisition of data, analysis and interpretation of data and drafting and revision of the final manuscript. AP contributed to the conception and design of the study, assisted with data collection analysis, interpretation of data and drafting and revision of the final manuscript. AW contributed to the conception and design of the study, assisted with analysis and interpretation of data and drafting and revision of the final manuscript. Funding This manuscript is based on a report which was funded by the National Institute for Health and Care Excellence (‘NICE’) through its Decision Support Unit. Data sharing statement Extra data relating to references of excluded full-text articles is available by emailing Edith Poku (e.poku@sheffield.ac.uk).